Lenovo Laptop ThinkPad T410 installed with Windows 10 Home 64bit. Intel Core i5 2.53GHZ with 8GB DDR3 RAM. Laptop comes with a 128GB SSD hard drive and DVDRW drive. It includes a 14.1″ display, AC Adapter, Charger, and battery. The T410 also includes 802.11g/n wireless WiFi, FOUR USB ports, VGA out, speaker and headphone ports, E-Sata, DisplayPort-out, firewire, SDHC card reader, ExpressCard/34, 10/100/1000 ethernet, and 90 day warranty. 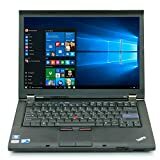 This entry was posted in Discount Computers and tagged 128GB, 2.53GHz, 64Bit, Certified, Core, DDR3, DVDROM, Laptop, Lenovo, Refurbished, T410, ThinkPad, Windows by Gadgets Manual. Bookmark the permalink.